The settlement's name derives from Adelasia, the name of the daughter of Emperor Otto I. Historians explain that the Emperor's race of Aleramicis has origins in this area. Alassio is situated between a strip of rocks, coves and golden beaches, and lies in a small bay between Capo Santa Croce and Capo Mele. In the province of Savona, the town is known for having the largest sandy beach of the Riviera. In summer it is one of the busiest stretches of coastline, not only for its exclusive bathing facilities and resorts, but also for refined cuisine and great amusement opportunities. In Autumn, the town is less crowded and the pleasantness of the climate offer the possibilities for long walks along the coast and on horseback riding in the nearby woods. The old town of Alassio clearly shows its medieval origins with its typical fencing and tall buildings arranged in a continuous manner along a narrow road. Of the original fortification system remains only the Torrione della Coscia and the Tower Cazulini. The town centre of medieval origin (X century), was under the control of the Benedictine monks in the XI century and then submitted to Albenga until the XVI century. 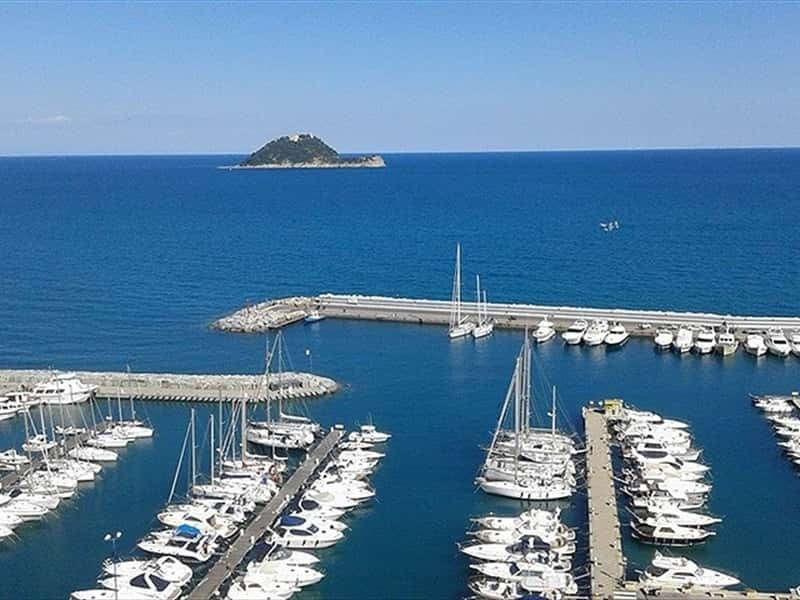 In 1528, annexed to the Republic of Genoa, the inhabitants of Alassio fought against the French and, a few years later, thanks to the benefits obtained in return for the aid granted in Genoa, the town became an important commercial center. After a brief period under the control of the Savoy, it was occupied by Napoleon in 1797 and annexed to the first French Empire. In 1815 it became part of the Kingdom of Sardinia and then the Kingdom of Italy. The Church of Madonna delle Grazie, built in 1266. The Parish of St. Ambrose, construction of ancient origin, rebuilt during the Renaissance. The portal and the bell tower date back to the XVI century, the façade of 1896. Inside the church preserves paintings of the XVI and XVII century by important artists of Liguria. The Romanesque church of Santa Croce, dates back to the XI-XII century, located near to an ancient Roman road. The Sanctuary of Nostra Signora della Guardia erected on Mount Tirasso in the XII century. The Church of St. Anne built in 1730, which preserves some artworks of the XVIII century and a wooden crucifix by sculptor Maragliano. The Church of Our Lady of the Snows, built in 1757 by the family of Boggiano. The Church of the Santissima Annunziata, built in 1382, with late medieval frescoes, paintings and sculptures of the XVII century. The Convent of St. Andrew of the XVIII century. The road corner of Via Cavour and Corso Dante's, which features a famous wall decorated with autographs of various famous people. This town web page has been visited 33,920 times.